Ribons rejoin with his forces, and bring them back into position he have new orders to investigate Veda while Revive and Hilling take care of things for a while with the help of Ray, that suddenly its not a inferior life form anymore huh? Ray notices that Alaws forces are moving strangely, while they battle outside of Veda, Frontal already made his way inside the super computer, he believes that having this information not only will help him decipher his enigmas but also guide his people to the future, however before he advances more the place he meets Ali and Ribons. Frontal is still sure that his plan will be allright he will confront Ribons and Ali, but inside Veda is proving difficult till Embryo reveal himself. Ribons uses Reborns gundam against the Neo Zeong, now that Dr.Hell escaped, Frontal is his only enemy, the battles goes on until they arrive on a stalemate and Ribons decides to use the Trans Am MS that kamikaze on the enemies. the battle goes on and Frontal is forced to retreat, Ribons calls a victory for now, Neo zeong is destroyed but the Sinanju lives, Angelo its mad and curses everyone else and bla bla, frontal says that its ok they got some data. "The galaxy starligh school for woman"
its a military school for girls and starting. , fail argue that she is not a pevert, Mami argue back that there's no way in the galaxy that Fail is not a big pevert, she looks like a big pevert no way around this, and she ask the cops to get the angry peverted lady away from her. Fail its some sort of weird magical girl villain like absorb energy bla bla bl, demanding that they release Mami Saila and Erina enters combat. Saila machine begins to be eated by the darkness, she fells the lower half of her body losing sensibility, Erina runs with saying that she will return to save Saila. The day is clear and there's no time to rest for these girls, 3 girls are training their dance moves for a live show, they are Akari, Hinaki and Mizuki the girls finish the training and its perfect, they are happy for the good day of work and exited to the next live soon. "Akari -- wonder if we will do that good live"
Erina explains that her friend has been captured by Fail, Sena has heard of that name,Erina says that Fail is trying to steal all smiles from the world,and they are trying to catch her,Doctor Sena explains that there's some evil energy that's expanding toward the school students and if they leave it be, it will expand more, the girls are idols and want to bring smiles to people, so it will be troublesome if they can't smile, so they form a space idol alliance when the school is attacked, and they deploy. Akari deploys on her apocalyptic machine whose visage is so horrendous that make the enemy tremble and run for their freaking lives, (its also stronger than Neo Granzon), the enemies of course have no chance against such monstrosity. Fail appears and says her plans to extinguish the smiles of the idols as well, they of course try to talk her out of it, and after it she summons Saila and Mami, and they both appear. Erina -- take care, when someone lose the ability to smile they become different. Thanks for doing this Mai. Thanks Mai, keep up the good work ! Erina calls out for Saila, but even tough her voice can reach her friend Saila won't respond. "Fail -- is useless she lost the ability to answer you, she don't have feelings anymore"
Akari stays a little chocked by knowing that the evil aura that Fail control is that strong, however they still need to do something about Saila, and a battle break out again as Erina ask for help of her new partners. it turns her into a magical girl, whatever happened Saila returned to her senses, Erina alerts her that the battle its not over yet as now Fail try to use Mami, however deep inside Mami's head she fells a voice calling her name and wake up to the visage of the FLCL cast. Tifa,Fudo Gen and Queen Diana, salude all the players, and talk about dimensions and stuff, Tifa ask how your colections is doing and say to expect new things soon. 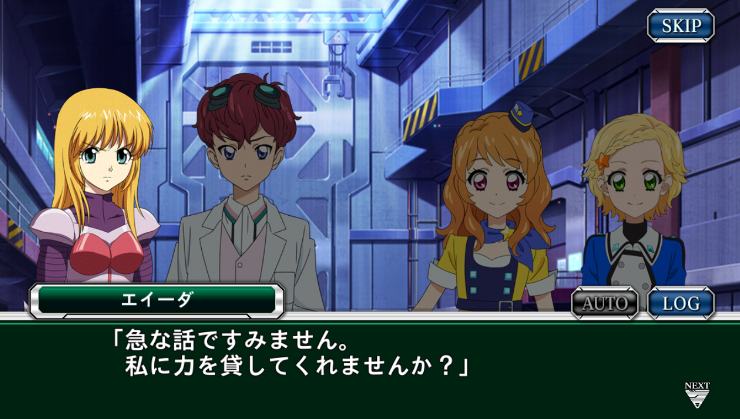 - "Super Robot Wars Cross Omega festival start!" - "Different from previous years this year we plan to do a race festival"